This unique building-per-year survey of a century of great architecture offers a superb introduction to the best existing structures built each year from 1916 to 2015 around the globe—and an irresistible must-see list for architecture enthusiasts everywhere. The founder of the blog A Daily Dose of Architecture, John Hill, is obsessed with his subject and determined to expose his fellow citizens to the glorious structures that shape our environment. In this beautifully designed compendium Hill presents his selection of the most significant building to be built each year from 1916 to 2015. Each two-page spread includes one or two large color photos and text that explains the importance of each structure. Starting with H. P. Berlage’s Holland House in London and closing with Diller Scofidio + Renfro’s newly completed Broad museum in Los Angeles, Hill has combed the globe for iconic buildings. Notable inclusions are Helsinki Railroad Station; the Solimar Building in Cuba; Le Corbusier’s Mill Owners’ Association building in Ahmadabad, India; Habitat 67, a housing complex in Montreal; and Tadao Ando’s Church of the Light in Osaka, Japan. What makes this collection so extraordinary is Hill’s criteria for the buildings included: each must be able to be seen, approached, or explored by the average person. An introductory essay and a timeline that highlights important architectural events round out this engrossing survey that demonstrates the underlying themes and developments in the world of architecture today. "In this anthology, John Hill presents a century of buildings. Adhering to a single yearly entry starting in 1916, Hill is able to intersperse big names with lesser-known players and abstain from focusing on architecture’s most iconic and thus frequently referenced periods. While he admits the range betrays his own Western perspective, the unique format draws out lessons in style, shifting priorities, and the ways in which global events are reflected in man-made places." "By cutting himself free of the artificial constraint of highlighting the 20th century alone, architect John Hill brings his survey of remarkable buildings up to the present…Hill’s approach forces a greater diversity than you’ll find in most guides to architecture’s greatest hits… It might even inspire building-gawkers to book a trip or two." 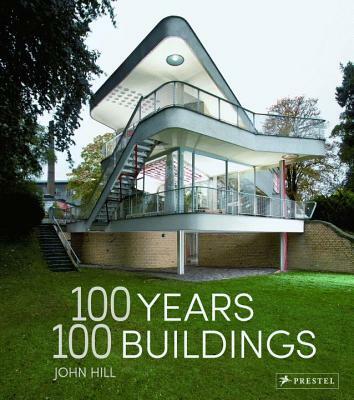 "Architecture expert John Hill’s comprehensive new book 100 Years 100 Buildings highlights an important structure from each of the past hundred years. . . . High-profile highlights from around the globe include Le Corbusier’s Villa Savoye (1931), Frank Lloyd Wright’s Solomon R. Guggenheim Museum (1959), and Jørn Utzon’s Sydney Opera House (1973), while lesser-known works are sprinkled throughout." "Hill combed the world seeking out its iconic buildings. The result is a book that’s a finely designed compendium – where he presents his personal selection of the most significant building from 1916 to 2015. And it’s not just about residences – there are churches, office buildings and museums too. Hill required that it be a building that’s still standing, and one that anyone could go and see in person . . . It’s a journey worth taking – in person or in print."